How important is sun exposure for bone strength? Lack of vitamin D, which is produced by sun exposure, leads to rickets, osteoporosis, osteomalacia and other bone diseases. In addition, research well after the first discovery of vitamin D has shown that vitamin D deficiency and sunlight deprivation also lead to many cancers, heart disease and multiple additional maladies. Now, as the world has modernized, the population is moving indoors, and even in the areas that are sunny throughout the year, sunlight exposure and vitamin D deficiency is increasing, both in rural and urban populations. The bones become so weakened without regular sun exposure, that the slightest movement may cause a fracture. As an example, the mother of an acquaintance of mine—a woman who avoided the sun—turned over in bed one night and broke her hip. 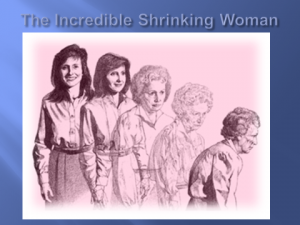 Osteoporosis often destroys all quality or life for those who suffer it. 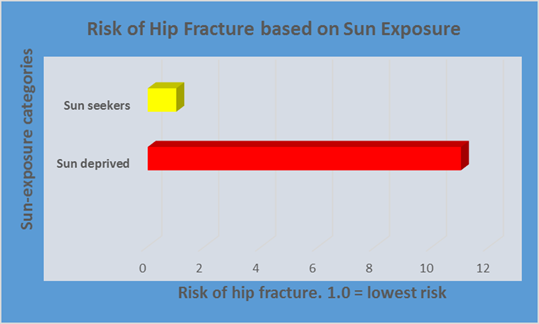 And here is a perhaps the transcendent study on hip fracture and sun exposure: research in Spain showed that women who were sun seekers had only about one-eleventh the risk of hip fracture as those who stayed indoors (See the chart below). That is very powerful evidence of the efficacy of sun in preventing weak bones. In stark contrast to this research are studies done on women who completely avoid the sun and suffer from osteomalacia. 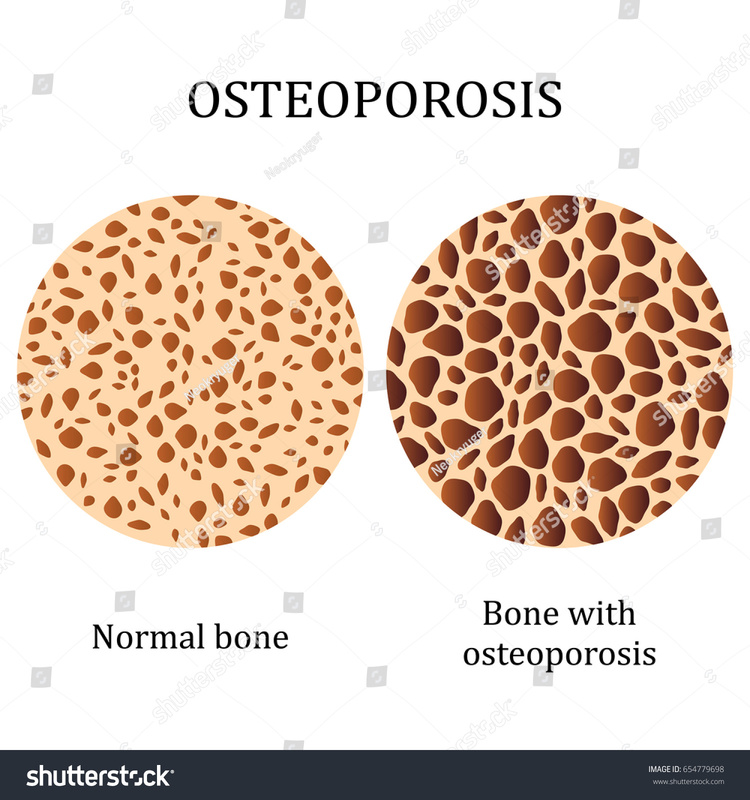 Osteomalacia is a soft-bone disease known as adult rickets, resulting from severe vitamin D deficiency, which deficiency prevents bone from properly mineralizing. Women who seldom go outdoors, or who are nearly always fully covered with clothing, have an extremely high incidence of osteomalacia at a very young age, even if they live in geographical areas with abundant sunlight. If one is never exposed to the available sun, the sun will not be able to produce its beneficial effects on the body, so one may as well live at the North Pole. Sunbed use also is associated with stronger bones and higher vitamin D levels. An excellent study compared 50 people who used sunbeds regularly with 106 who did not. The sunbed group had 90% higher vitamin D, significantly higher bone density and lower PTH levels (high PTH levels are associated with lower bone mass). The users had healthful vitamin D levels of 46 ng/ml [115 nmol/L] compared to only 24 ng/ml [60 nmol/L] for those who did not regularly use sunbeds. Scientists at one time believed that sunlight and vitamin D were good only for preventing rickets, osteoporosis and other bone weaknesses. That belief has been supplanted by myriad research studies that show the efficacy of both sun exposure and vitamin D repletion on protection against numerous additional diseases. Nevertheless, we should never forget the extraordinary, never-changing value of sun exposure to maintaining a strong skeleton well into old age. Al-Jurayyan NA, El-Desouki ME, Al-Herbish AS, Al-Mazyad AS, Al-Qhtani MM. Nutritional rickets and osteomalacia in school children and adolescents. Saudi Med J 2002;23:182-85. Tangpricha V, Turner A, Spina C, Decastro S, Chen TC, Holick MF. Tanning is associated with optimal vitamin D status (serum 25-hydroxyvitamin D concentration) and higher bone mineral density. Am J Clin Nutr. 2004 Dec;80(6):1645-9. The Indian Menopause Society (IMS), is an organization whose motto is to keep women fit at 40, active at 60 and independent at 80. One of their suggestions is that women stop soaking up sunscreen and start getting outside at peak sunlight time–for at least 15 minutes daily. The idea is to use the most natural manner possible to optimize vitamin D levels and thereby reduce the risk of osteoporosis and other bone diseases. It is gratifying to see that there are women’s health organizations that understand the life-saving importance of sunlight. India is to be congratulated for cutting past the anti-sun nonsense and leading the world back to enlightenment. This is an excellent article from the Times of India. A physician from Japan, Dr. Sato, proved several years ago that osteoporosis is reversible and that fracture risk is profoundly reduced by sunbathing (Sato, Y. Amelioration of osteoporosis and hypovitaminosis D by sunlight exposure in stroke patients. Neurology 2003;61:338-42). Research from Spain has also shown that women who actively seek the sun have about 1/11 the risk of a fracture as those women who stay indoors (Larrosa, M. Vitamin D deficiency and related factors in patients with osteoporotic hip fracture. Med Clin (BARC) 2008;130:6-9). 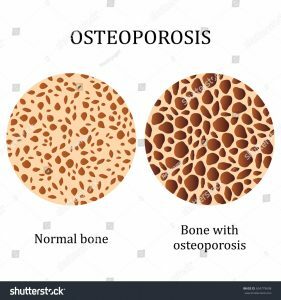 Considering that sunlight exposure is established as a preventer and reverser of osteoporosis, it is good to see that others in the medical field have recognized that lack of sunlight is leading to terrible bone weakness, in this case, osteopenia (what I call “osteoporosis light”). Because of a tendency of women in Dubai to cover up and avoid the sun, the risk of osteopenia is seen at much younger ages than in the rest of the world. The take-away is that the human race needs to return to its sunlight roots or risk crumbling and falling apart. Please read the studies and help spread the word about how bone diseases can be prevented and reversed by regular sun exposure.